Vacations don’t have to be expensive. There’s no need to pay for a fancy hotel that you’ll likely only be sleeping in. This is especially true when visiting Bend. As an outdoor paradise, there are plenty of great places to camp in Central Oregon. Camping – both in tents and RVs – not only saves you money but it can also put you right where you want to be to enjoy the variety of outdoor activities that Bend has to offer. Plus, if you are simply visiting to take in the views, camping can put you closer to natures where there are no walls to get in your way. 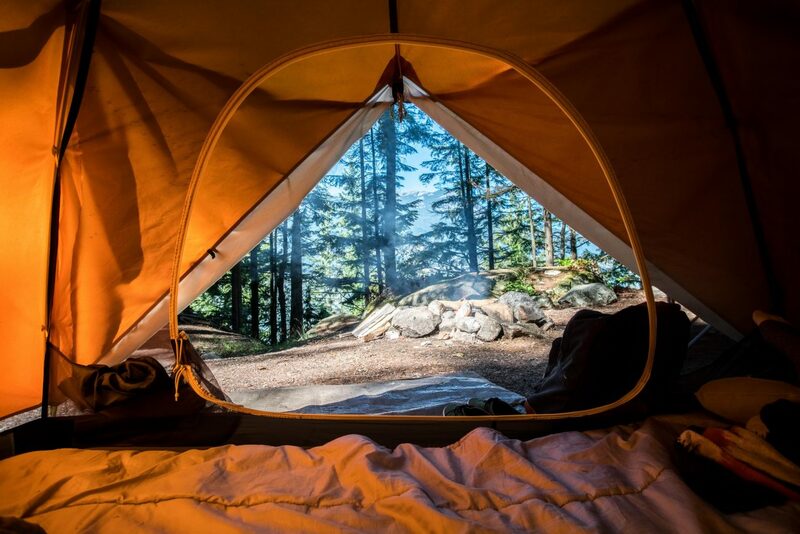 There are several great spots for camping in Bend, Oregon, both for parking your RV and pitching your tent. You can even find quite a few establishments just outside of Bend should you wish to explore a bit more of Central Oregon while you are there. Although it’s located nearer to Sisters, the Bend/Sisters Garden RV Resort is close enough to be considered a place for camping in Bend, Oregon. The resort features camping cabins and fully furnished cottages, as well as RV sites. The atmosphere is warm and friendly, the perfect location for a family vacation. You will even find a seasonal garden environment with various plants, trees, and wildflowers. Time your stay right and you can also enjoy a variety of events and activities that take place throughout the year. Few places beat the luxury of Crown Villa RV Resort when it comes to camping in Bend, Oregon. The RV sites offer full hookups complete with 50/30 amp service, water, sewer, cable TV, and free wi-fi access. You can also enjoy the surroundings with about 1,500 square feet of grassy area with shade trees to relax under on warm summer evenings. If you are looking for some activity on-site, there is a clubhouse, fitness center, horseshoes, and tennis and pickleball court. You don’t need to go far from the Old Mill District to find one of the areas for the best camping in Bend, Oregon. Scandia RV Park is conveniently located in the heart of Bend within walking distance from some of the best restaurants and cultural activities. Upon arrival, you will be welcomed with friendly smiles from Richard and Deanna, the site’s owners and managers. They are usually pretty busy during peak season – June through August – so reservations are strongly recommended. Some of the best camping in Bend, Oregon is located in the Deschutes National Forest, including the Crane Prairie Reservoir Campground. The campground is relatively easy to find with easy access to the scenic Cascade Lakes Byway. 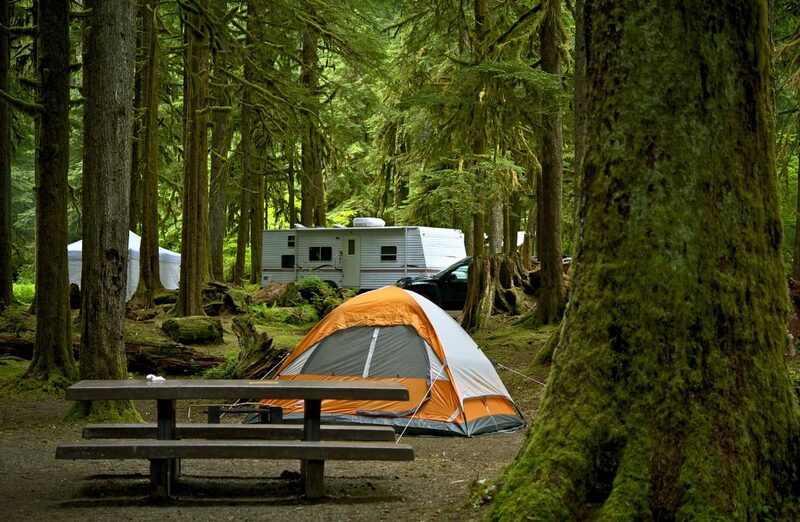 The campground accommodates both RV and tent camping with full hookups and campfire rings with grills. You can also enjoy boating and fishing right within the park at fisheries near your site. Hiking and hunting are also popular activities for the area. Located on the Deschutes River, the Tumalo State Park Campground is a great site for camping in Bend, Oregon. You have easy access to the river and all the activities associated with it – boating, paddle boarding, and rafting – as well as nearby hiking trails. There are several full hookup sites, even more tent sites, and a few yurts (two of which are pet-friendly. All of the sites can be reserved a day in advance if you are making last minute plans or up to 9 months ahead. You are still technically camping in Bend, Oregon when you stay at the Bend-Sunriver RV Campground. Located on 283 acres along the Little Deschutes Rivers. Fishermen from all over will enjoy this quiet little location away from the hustle and bustle of the city. Near the campground, you also have access to horseback riding, hiking, kayaking, canoeing, and swimming. If you are a winter traveler, you will also enjoy nearby Mt. Bachelor for skiing on snowy days. Though the Bivy at Smith Rock State Park doesn’t allow RVs or trailers, it is still a great place for tent camping in Bend, Oregon. Located in the scenic Smith Rock State Park, this campsite often fills up fast on the weekends in spring and fall. Get in early! Because this is in a state park, you are only allowed to stay for a maximum of 14 days and are required to leave for at least three days before returning for another stay. Keep this in mind when you are planning your next camping trip. Another great place located in the Deschutes National Forest for camping in Bend, Oregon is Paulina Lake Campground. Located 6,350 feet above sea level in Newberry Volcano, Paulina Lake Campground highlights the volcanic landscapes and thick forests of central Oregon. This site is suitable for all types of camping, including RVs as well as tents. You can enjoy boating, fishing, and shoreline trails along the lake as you take in the scenery and view of the beautiful lake. A bit smaller than the previous site in the Deschutes National Forest – with no RV hookups – is the Fall River Campground. This is a great place for camping in Bend, Oregon if you’re after more of a “rough it” camping feel. Fall River’s headwaters are perfect for fishing as they are stocked every year with brook and rainbow trout. All sites are equipped with a picnic table, campfire ring, grill, and vault toilets. However, you will need to provide your own drinking water. Located 37 miles southwest of Bend on the shores of Elk Lake is Little Fawn Campground. They offer a lot of single-family sites and a few single sites that can be booked together if you want to take a larger group. This spot for camping in Bend, Oregon accommodates for tents and RVs; however, there are no electrical hookups. Bring your friends and family here to enjoy views of South Sister and Mt. Bachelor in addition to the wetlands and forests. Just one of the campgrounds located on Sparks Lake – another nearby is Devils Lake Campground – is Soda Creek Campground. Fed by a stream coming from snowmelt on Broken Top, Sparks Lake rests in a volcanic lakebed. Just like Little Fawn, you can bring your RV (or tent), but there are no electric hookups. All sites are equipped with a picnic table, campfire ring, and grill, and there are vault toilets available. You will need to bring your own water supply. Near the shores of Scout Lake in the Deschutes National Forest is a popular destination for camping in Bend, Oregon. With its close proximity to lakes, forests, and mountain peaks, this is a go-to location for outdoor enthusiasts. There are sites with electrical hookups for RVs as well as nonelectrical sites for tents. Nearby, you can explore about 1,600 miles of trails that cover 2.5 million acres of the Deschutes National Forest and Ochoco National Forest (next door). Crooked River Campground in the Cove Palisades State Park is a great place for family camping in Bend, Oregon. You can enjoy some of the luxuries of home, like flush toilets, hot showers, and electricity, while staying close to nature and outdoor activities. The Crooked River Campground is RV only, but the Deschutes Campground – which is also in the Cove Palisades State Park – offers both tent and RV camping if that is what you desire. Looking for a place to enjoy excellent camping in Bend, Oregon with breathtaking views within minutes to outdoor activities? Look no further than River Rim RV Park, complete with views of Central Oregon and the Cascade Mountains. If you want a bit more than just outdoor activities, River Rim RV Park is also close enough to “civilization” to enjoy a meal out, play a round of golf, or pick up some essentials at the nearby mini-mart. Feel free to bring your pup along too; they have a fully fenced dog park on site. In La Pine, Hidden Pines RV Park is the RV camper’s paradise. They offer full hookups – including electric, water, sewer, wi-fi, and cable TV – as well as on-site showers, toilets, and laundry facilities. You will have everything you need to feel comfortable away from home. Here, you can enjoy an abundance of outdoor activities without having to go far from your campsite. Catch some fish. Enjoy a hike or bike on one of the nearby trails. In the winter, you can also enjoy snowmobiling and skiing. A premier location for RV camping, Cascade Meadows RV Resort is located right in the middle of Central Oregon’s Cascade Mountains in La Pine, only 22 miles outside of Bend. Being right in the mountains, you will never run out of trails to bike and hike during your stay. In the area, you will find golf courses with lakes for fishing and boating only a short drive away. There are even places to enjoy some fine dining nearby if you get tired of cooking at your campfire. Because of its close location, a stay at Newberry RV Park is practically still camping in Bend, Oregon. It is a great central location to enjoy some great outdoor activities, like Paulina Plunge, as well as nearby lakes for the avid fisher. Just a 22-minute drive away is Sunriver Resort. Here you can find a variety of activities like guided horseback rides on the trails from the stables. There is also a water park – complete with slides – that will be fun for the kids. Want to save even more money? Try one of the free campsites near Bend. Most of these are located in state parks, so keep in mind you will only be able to stay for a maximum of 14 days before you have to move on. 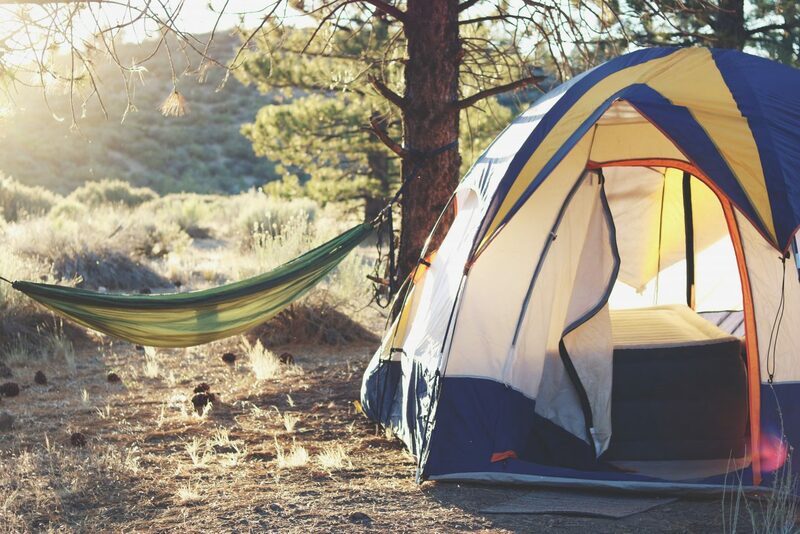 As long as you remember this, you can enjoy some free camping in Bend, Oregon, complete with sunshine and gorgeous scenery. There are several campsites off Skyliners Road, but one in particular has relatively established campsites and RV pull-offs. There are a few quality pull-off spots within the first ¼ mile off the road, but the further you go, the rougher it gets. Access to further pull-offs will depend on how well your vehicle handles. You can also enjoy tent camping at sites with established fire rings ready to go. Skyliners also overlaps with Phil’s Trail, great for biking and hiking. This is another free camping spot in the Deschutes National Forest. The trees are widely spaced apart, offering space for pitching tents as well as exploring while still providing shade when needed. It is an ideal place to stay if you want to visit the High Desert Museum and Volcano National Monument. There is space for RV parking as well as tent camping. You can also enjoy hiking and hunting right in the area.